There is a whole heap of emotional and mental issues often tangled up in neurodiversity. Speaking all posh – there is a documented comorbidity with anxiety, stress, depression, low self-esteem and so on. Not easy stuff to write about. And not stuff to just sweep under the carpet and pretend does not exist. Personally I have an interesting response to stress and it’s probably not that unusual. I need a bit of stress to get me going. Good stress. Eustress. This is what gets me out of structured procrastination. It’s what makes me prioritise. Because I know this I can exploit it. I break big tasks up into smaller milestones so it’s not a 14-hour shift on the last day but a couple of hours a day over a week or so. I can set daily, or weekly, or monthly goals. I’ve been doing this all the way since high school with my immaculate multicoloured revision timetable long before I knew I was dyslexic. Eustress is a good thing it drives motivation and focus. I like to think I have a mastery of my stress (handy given my habit of overcommitting), but.. 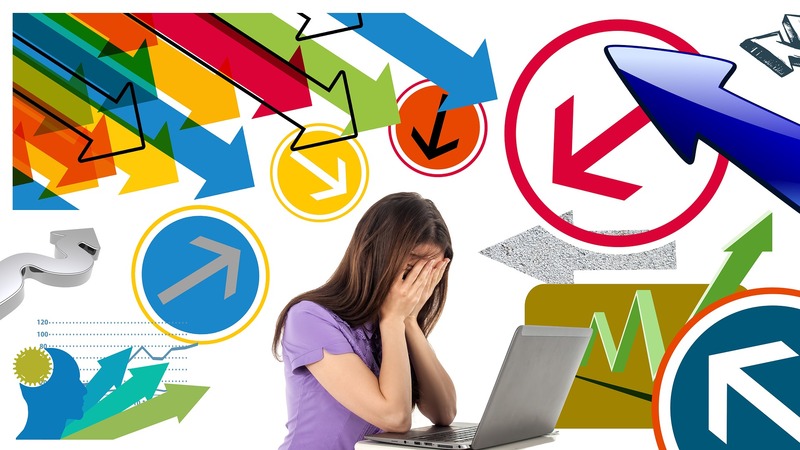 When the amount of stress passes the stress threshold it moves from being eustress to being distress. This is a bad thing. Distress reduces mental capacity. It often moves analysis from the logical brain into the primitive reptilian (or chimp if you’ve read The Chimp Paradox). It can trigger the flight or fight response. Distress also causes hormonal changes. Cortisol is released. Too much cortisol can suppress the immune system, increase blood pressure and blood sugar level, decrease libido, produce acne, contribute to obesity and more. For me, the transition from eustress to distress is a rapid one. As stress increases my focus increases, my directive tendencies come to the fore and I become more productive. None of this is necessarily bad but I may appear abrupt. And then the line is crossed. Sudden onset overwhelm. It might be all a work thing, or all a home thing, a mix of both, or even an imbalance between the two (loads to do at home but relatively chilled at work). I’ve probably only had 5 or 6 such episodes like this during my professional career (and never before). It’s debilitating. A fuzzy cloud enters my brain and I can’t think straight. My (already poor) working memory goes all together. This creates a spiral and I lose the tools that might help me out of the hole. For me when I am overwhelmed the priority is to get back in control. To get back to a state where I can use my logical brain. This might be reviewing priorities in a journal (I started journaling to dig myself out of a distress episode) and making changes. Nearly every time I’ve been in this situation this has involved accepting that something I had committed to someone else would not get done. Fronting up to that early enables the situation to move on. Often dates can be revised, or quality criteria changed, or additional support drafted in. People don’t like bad news or surprises but do value finding out sooner rather than later. The only thing worse than bad news is bad news delivered at the last minute that could have been fixed if reported earlier. Odd little things can trigger my stress response, well when I think about it and my spiky neurological profile it’s not that odd. Someone reading out 6 steps I need to remember and follow (directions to a meeting, instructions for something) when I can’t write it down can cause me to panic that I’ll forget, and worry about what happens if I forget (and not in a positive visualisation way either). This burns precious brain cycles increasing the chance of a bad outcome. Sometimes when I am trying to recall something my mind blanks. If this is something I really feel I should know (colleagues name, current project spend) and not knowing would be embarrassing a panic state sets in inhibiting fact recall. This model depicts the likely experience that will result from different levels of perceived challenges and perceived skills. 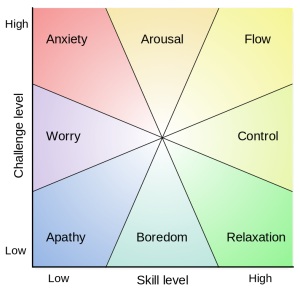 It is based on Mihaly Csikszentmihályi’s flow model. 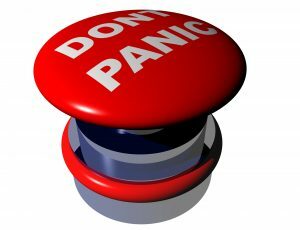 I’ll blog separately on how moving to control tasks can help combat worry and anxiety. I don’t like to use my dyslexia as an excuse. Dyslexia does not stop me from doing anything. I’ve seen a dyslexic with a poor working memory memorise a whole pack of cards. I’m a big believer in the growth mindset. However “coming out” as dyslexic can be a useful pre-warning of likely challenges. I tell my bosses if I don’t have my spreadsheets with me I’ll not comment on finances figures as I’ll either not be able to remember, or remember wrong. I’ll happily get back to them with what they need, but not there and then. Meditation and breathing exercises are great techniques for managing stress. I must confess to being a little too ADD for meditation (and it’s probably poor form to listen to them at 2x like I do with audio books). I’ve found the breathing exercises at the end of yoga a hand way of returning focus though don’t seem able to recreate this out of a yoga class. Exercise is another big one for me. It can be a gentle walk in the country (without headphones), a relaxing tempo bike ride or even a gruelling high-intensity workout. Perhaps the biggest mitigation of all though is sleep. Which is ironic as sleep is often disturbed as stress levels increase. Regularly getting 8 hours quality sleep helps to reduce stress hormone levels.